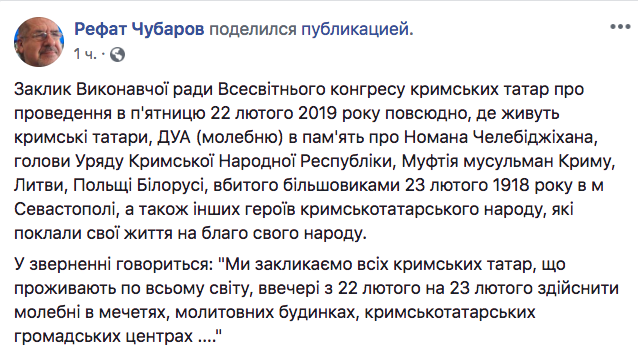 World Congress of Crimean Tatars called for a prayer service in memory of ChelebidzhikhanThe Executive Council of the World Congress of Crimean Tatars calls for a prayer service in memory of Noman Chelebidzhikhan, according to the information on the organization’s facebook page. We call on all Crimean Tatars living around the world to perform prayers in mosques, in prayer houses and Crimean Tatar public centers in the evening of February 22-23. The call for prayer with the translation into Ukrainian was placed on Facebook by the Head of the Mejlis of the Crimean Tatar people Refat Chubarov. Noman Chelebidzhikhan was a Crimean Tatar politician and public figure, the first Chairman of the government of the Crimean People’s Republic proclaimed in 1917, the organizer of the 1st Qurultay of the Crimean Tatar people, the first mufti of Muslims of Crimea, Lithuania, Poland and Belarus. Also known as the author of the poem “Ant etkenmen” (“I swore”), which became the national anthem of the Crimean Tatars. On February 23, 1918, Chelebidzhikhan was shot in Sevastopol prison by Bolshevik sailors, and his body was thrown into the Black Sea.